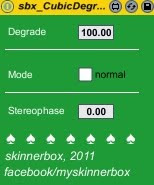 CubicDegrade is actually a downsampling device but with a twist. It performs regular downsampling when you decrease the "Degrade" value. Then a 4-point (cubic) interpolation on the last four samples recreates a continuos signal curve. This "flattens" the steps/ jumps that occur when a signal is downsampled. Practically it´s a hi-cut filter with a strong harmonic distortion. Unlike usual hi-cut filters the parts of the signal above the cutoff-frequency are not diminished in amplitude. Instead they are "reflected" at the cutoff-freqency and fold back onto the remaining spectrum. This is because downsampling is performed here. So this is substantially a brickwall filter. Because of the foldover it also creates remarkeble sub(non)harmonic content the more you downsample. So with low values of "Degrade" it´s a quite powerful subbass generator also. playing or sound and others are just poor quality.